Fascinating, thanks Alex. I have recommended oil and wax-based serum type things for years and this will make me do it more. 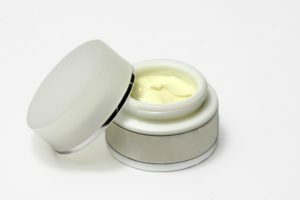 I believe there are some probiotic-based skin products out there, have been for years, but they don’t seem to have expanded as much as other areas – presumably because you need to keep them refrigerated to keep them live? One option I’ve often given is to stir some probiotic powder into your favourite cream and make your own. That needs to be with no essential oils or herbs in that will kill the probiotics though. You’re welcome, Micki. Yes, there are, and we’ve had a few enter the Awards – such as Aurelia Probiotic Skincare – but there’s still the question that these creams have to be preserved, so what the effect of those preservatives are on both the skin and the probiotics in the product remains one to answer. And yes, there’s the refrigeration issue too … I like the idea of DIY probiotic powder in your own EO-free oil blend, but … which probiotics? I think that’s another issue that may need exploring. I doubt one size fits all … but you probably know more about this area than me, at least for the gut! I love a good article backed up with a decent peer reviewed study! It confirms what we have known all along. After all, it’s common sense. Preservatives are not intelligent. Preservatives, like any chemical, can not differentiate between mammalian cells like ours, unwanted microbial cells and wanted microbial cells. ALL cells get attacked equally. So it’s imperative we use preservatives in which the method of action is fully understood, which causes the least harm, at the lowest possible concentration, to reduce risks. Probiotics is an even far more complex subject field. Yes, it is documented and understood a healthy microbiome is essential for health. However, what isn’t understood is what exactly constitutes as a healthy microbiome, as a healthy microbiome varies wildly from person to person and contains thousands of different species. Each person’s microbiome is as unique as your fingerprint. So slathering a probiotic containing only a few species of microbes onto your skin is at best, ill-advised and there are numerous studies to confirm this, as probiotics can actually reduce biodiversity on your skin. The best way forward is to use skincare that nurtures your microbiome rather than attempting to change it, either through pseudo-science or harsh chemicals. Thanks Kal. Some preservatives are more targeted and effective at dealing with certain types of bacteria / virus / mould while others have more ‘broad spectrum’ qualities so is it accurate to say that all cells get attacked equally? But I agree re: probiotics: hugely complex, so much still to learn, and uncertain benefits … though I like the idea of supporting what you’ve got! Thanks for the link – will take a look. Alex. That is a good point Alex. You are correct in saying that some preservatives work more effectively against certain bacteria, fungi etc. This is down to how the preservative causes damage to the cell in order to kill it. So while not all microbes are affected the same, all cells are subjected to the same chemical disruption. This is mainly down to the physiological differences between gram positive/negative bacteria and yeasts / moulds. There are beneficial and harmful microbes in each category and it’s impossible to target a single strain of a harmful microbe without also harming similar beneficial microbes in the same category – this is partly why antibiotics shouldn’t be taken unless necessary. All of that and that’s before we even look into how our skin is affected which is really going into the unknown as there is a very complex relationship between your microbiome and the immune system itself.